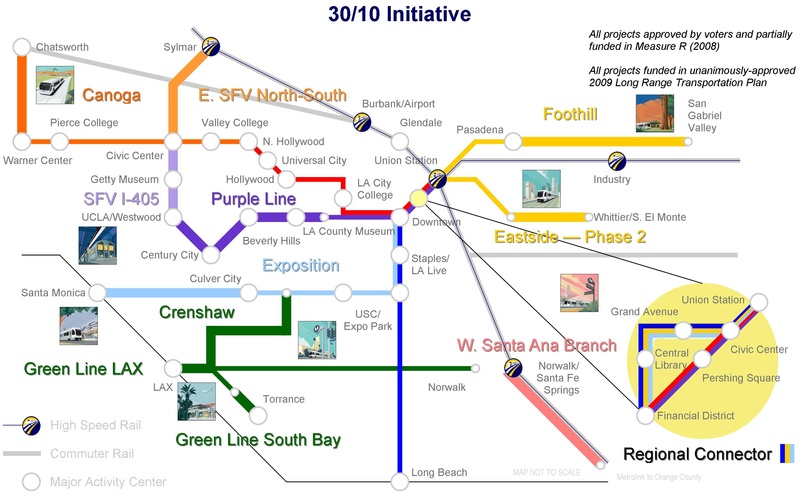 A map of the 30/10 Initiative transit projects created by the office of Los Angeles Mayor Antonio Villaraigosa. Click above to see larger image. The Board of Directors of Metro on Thursday unanimously voted to support the 30/10 Initiative that proposes to seek federal funds to build a dozen mass transit projects in the next 10 years instead of the 30 years. The plan also would try to speed the construction of some highway projects. The initiative does not guarantee any money will be forthcoming from Washington. It is, in essence, a license for Metro to pursue federal loans and other financing. The approval also shows the federal government that there is local support for the plan — something that Washington almost always requires before funding transportation projects. (Here’s a link to Metro staff’s recommendation to support the policy). The 30/10 Initiative was first proposed last fall by Los Angeles Mayor Antonio Villaraigosa, also a member of the Board of Directors. The initiative, as written by Villaraigosa, focused on 12 transit projects that were part of the Measure R half-cent sales tax increase approved by 68% of Los Angeles County voters in Nov. 2008. Under Measure R, projects can’t be built until sales tax revenues flow into county coffers. The basic premise of 30/10 is to use federal loans and bonds to build projects now — then use Measure R to repay the feds. The thinking is that the cost savings of building projects sooner rather than later offsets any financing costs. One thing is certain: it’s a big ask. The Mayor’s plan requires $8 billion of help from the federal government just for the transit projects. It’s also unprecedented. “Folks, realize we’re in unchartered territory here,” said Board of Directors Chairman Ara Najarian. Some of the transit projects that 30/10 would accelerate are well-known and already deep in their planning stages. For example, under the current Metro long-range plan, the Westside Subway Extension would reach Fairfax Avenue in 2019, Century City in 2026 and Westwood in 2036. Under 30/10, the subway would reach Westwood by 2017. The subway and another Metro project, the Downtown Regional Connector, are also applying for federal New Starts moneys to help pay for their construction. Some of the Measure R and 30-10 projects, however, still need to be defined and planned. One of those is a transit project that would span the Sepulveda Pass and connect the San Fernando Valley to the Westside. The 30/10 plan envisions that opening in 2018, yet initial studies to confirm the need for the project and define it have not yet begun. A full list of the 12 projects is on the new 30/10 page on Metro’s website. At the political level, the debate over the 30/10 plan was a more subdued version of the often intense and fractious arguments in 2008 in the run-up to putting Measure R on the county ballot. Those debates revolved around the projects that Measure R would fund, with different parts of the county lobbying to get their projects on the list. Similarly, public officials have been pushing for 30/10 to be expanded to highway projects that were also part of Measure R, saying that all parts of the county are paying the sales tax and deserve something in return. Two members of the Board of Directors — Diane DuBois and Pam O’Connor — introduced a motion earlier this month calling for 30/10 to be expanded to include highway projects. As a result, 30/10 will proceed on two tracks. One part of the plan will focus on the 12 transit projects. Another will try to find money to help speed the construction of highway projects, including those that may quality as public-private partnerships. “The support from Washington is clearly for the transit projects,” said Richard Katz, a member of the Board of Directors, who also expressed support for including highway projects in the initiative. Indeed, 30/10 has received considerable media and political attention over the past few months. California Senators Barbara Boxer and Dianne Feinstein have shown interest, as has Congresswoman Jane Harman and U.S. Transportation Secretary Ray LaHood.